After the harvest originally uploaded by ToniVC. 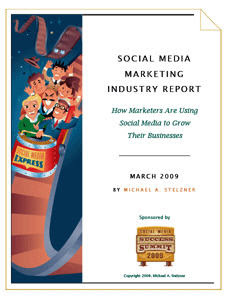 Have you taken a look at the Social Media Marketing Industry Report that Michael A. Stelzner from WhitePaperSource created in March 2009 based on feedback from approximately 900 marketers on how they are using social media to grow their business? It will definitely have you thinking about your business and how you might apply these tools in innovative ways -- regardless of whether you are a neophyte, an expert or even a guru! When you visit WhitePaperSource, you have the option of a short video clip where Michael takes you through the report highlights. Or you can simply download the report! First, some interesting stats on the respondents: 78% of them ranged in age from 30 to 59 with the median being between 40 and 49. 56% of respondents were women. This, to me, highlights that a wide range of marketers are exploring how to market with social media. The report in organized into Major Findings, the Top 10 Social Media Questions Marketers Want Answered, the Use of Social Media Marketing, Time Commitment, the Benefits, it breaks down which are the most commonly used tools, and then details which tools people want to learn more about. Each section has interesting nuggets. According to the major findings, marketers want to understand the best tactics, how to measure success and where to start with social media. Not too surprising especially since these various social media tools are only just now becoming accepted vehicles in the marketing world. The discussion about time brings to mind what I call the social media paradox: the more involved you are in social media, the more time it takes because it leads to community and conversation, strengthening the ties with your brand, product or service. Which this report supports: "The number-one advantage [or social media marketing] is generating exposure for the business, indicated 81% of all marketers, followed by increasing traffic and building new business partnerships." An added benefit is an increase in search engine rankings, better qualified visitors and leads, and a decrease in overall marketing costs. I'm not surprised to see that Twitter, blogs, LinkedIn and Facebook rank as being used most frequently. Twitter is easy to use, moves fast and allows for brief but broad interactions; blogs are more intense, making for deeper and focused interactions; LinkedIn has become an effective platform for business networking and interaction, particularly with groups and the opportunity to ask/answer questions in a formal setting. Finally, Facebook is the more casual place to interact, but it also aggregates the other social streams [Twitter, Flickr, blogpostings, etc. ], encouraging casual commenting. 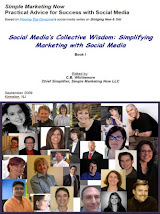 Finally, marketers want most to learn about social bookmarking sites and Twitter. Do download the report. Read through it. Internalize what it says. 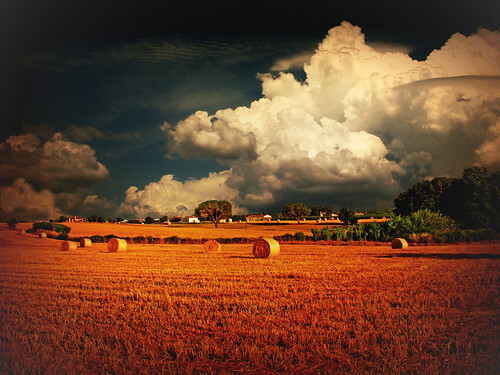 Savvy marketers are using social media specifically to grow their businesses. The opportunity is to do the same for yours.